The most fascinating element of the film is its formal linking of its multiple, no-nonsense protagonists. 123 min. Miramax Films. Directors: Joel Coen, Ethan Coen. 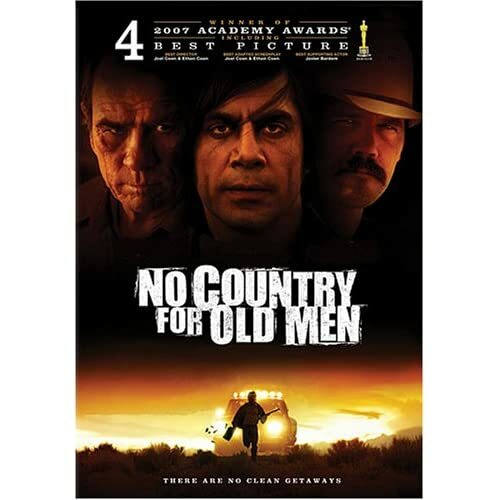 Cast: Tommy Lee Jones, Javier Bardem, Josh Brolin, Beth Grant, Garret Dillahunt. When Tommy Lee Jones' Sheriff Ed Tom Bell lays out a series of criminal events as he sees them, his deputy replies, "That's very linear, sheriff." This moment in No Country for Old Men is typical of its directors' dry humor and self-reflexiveness. Joel and Ethan Coen, the men who made a film about a screenwriter's "life of the mind" (Barton Fink) and a true-crime film about a crime that never happened (Fargo) have an understandable fascination with narrative, incident, and technique, and their Oscar-winning Best Picture of 2007 shows they haven't lost their capacity for formal brilliance. 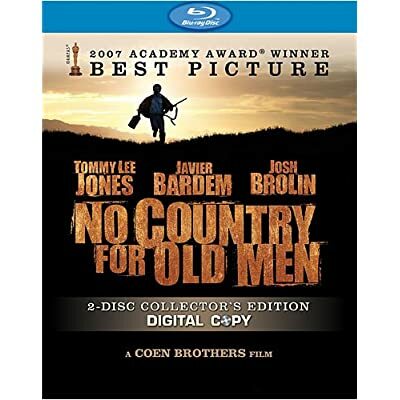 In offering a faithful rendering of Cormac McCarthy's existential crime thriller, the Coen Brothers tell a tale in triplicate of lonesome men who no one understands. At least the Coens have each other. The bleakest film of the year, No Country for Old Men applies the Coens' typically consummate craft to unsettle the audience with chaotic fatalism. When a drug deal gone wrong leaves $2 million up for grabs, a serial killer (Javier Bardem), a sheriff (Jones), and an average Joe (Josh Brolin) play a cat and cat and mouse game—all learning the futility of trying to even out the universe with retributions and reclamations. Frisky dialogue, laconic humor, and vital performances add to the film's engrossing narrative drive, achieved largely through longtime Coen cinematographer Roger Deakins' mesmerizing photography. The most fascinating element of the film is its formal linking of its multiple, no-nonsense protagonists. Bardem's mop-headed murderer Anton Chigurh slaughters a man as if the victim is an animal, then we see Brolin's Llewelyn Moss—once a sniper in Vietnam—taking aim at a deer (draw your own conclusions about man's nature--Chigurh later shoots at a crow for sport). Prey Chigurh sits, reflected in a television set; predator Bell sits in the same spot, seeing what his man has seen. Taking the idea one step further, Bell says of Moss, "He's seen the same things I've seen, and they've certainly made an impression on me." The dispiriting role of violence in human history and the inability of good people to stop the seemingly rising "dismal tide" is reflected in the three men: a killer—whose unrepentant evil is passionless—doing what he does because it is his nature, a man who has dedicated his life to pursuing and apprehending wrongdoers (what, he wonders, does he have to show for it? ), and the typical man in the middle, compelled to grab money, whose guilt gets him in more trouble than his crime. The men's codes, or moral gestures, win them nothing but a few steps closer to their own inevitable graves. As Chigurh puts it to one victim, "If the rule you followed brought you to this, of what use was the rule?" It's no wonder that all three lose their religion when fate comes calling. As Bell says in his opening narration, "I don't want to push my chips forward and go out and meet something I don't understand. A man would have to put his soul at hazard. He'd have to say, 'O.K., I'll be part of this world.'" I told you it was bleak. Perhaps Moss' fate is most ignominious since he has stumbled into "this world" (and chosen to stay) while Bell and Chigurh are in it by personal design. Or perhaps the coin-flipping Chigurh is right in seeing himself as an agent of fate—a man wielding a god's power in a godless, apathetic universe. But even Chigurh is no less a slave to fate—something brought him to this place, and something will eventually remove him from it. Bell mentions that his grandfather and father were both prominent lawmen, though he's thinking of getting out of the wearing profession of facing incomprehensible evil. Bookended scenes of youth corrupted by money—three college-age men at the border and, later, two young teens in the suburbs—would seem to support the old men's opining about "the dismal tide" (one of the younger boys tries to refuse money, but later squabbles to keep it; the older boys show a callous "evolution"). But these incidents speak as much to "the root of all evil" as anything else. Another sheriff's grumbling to Bell about kids "with green hair, bones through their noses" testifies not to dissolute youth but to the generation gap. Smiliarly, Bell's limited perspective that "the crime you see now, it's hard to even take its measure," while easy to empathize with, neglects to acknowledge that irrational murder and war, in the words of Bell's Uncle Ellis, "ain't nothing new" (ironically, Bell describes his job as "all-out war" these days). It's no country for old men cursed with contemplation, sifting through an accumulation of despair, realizing their infinitesimal, ineffectual roles in the grand scheme. Perhaps the final judgement at the end of days will not come from our fathers or "Our Father" but ourselves. Then we will be gone, and little will have changed. Merry Christmas from the Coen Brothers! "I laugh myself sometimes. There ain't a whole lot else you can do," says Bell, and the Coens have made a career of it (indeed, there they were on Oscar night, grinning like jackals and giggling like children while collecting their awards). No Country for Old Men keeps their self-damaging snark and smugness of tone to a minimum (though they can't resist a jarringly gauche visual gag involving mariachis at dawn). As many have noted, No Country for Old Men is closest in tone to the Coens' first picture, Blood Simple, but now with a quarter-century more experience and acquired skill. The acting is thoroughly in tune with the picture. Jones gives as good (and as world-weary) a performance as he's ever given, Brolin reaches a career peak in his laconic, highly physical performance, and Bardem's creepy, Oscar-winning take on Chigurh has landed him in the Movie Villains Hall of Fame. Kelly Macdonald, Woody Harrelson, Garret Dillahunt, Tess Harper, Barry Corbin, and Stephen Root likewise deserve notice. DP Deakins, too, qualifies as a star, crafting beautiful, epic landscapes that made the Academy sit up and take notice (New Mexico doubles for 1980 Texas). Deceptively spare, the film is crammed with frisky dialogue and allegory that lives up to Bell's utterance "Signs and wonders." The film's final, ethereal anti-confrontation between good and evil evokes the fear and lack of resolution reflective of the real-life, ongoing confrontation between good and evil. In the Coens' hands, it is a purposefully ambiguous scene that positions Chigurh as the stand-in for evil in all its mystery and dramatizes Bell's strength of character, as well as his sense of failure and possible compromise. In the end, No Country for Old Men is another story, one that fits the Coens like a glove. "A true story?" asks Bell. "I couldn't swear to every detail, but it's certainly true that it is a story." 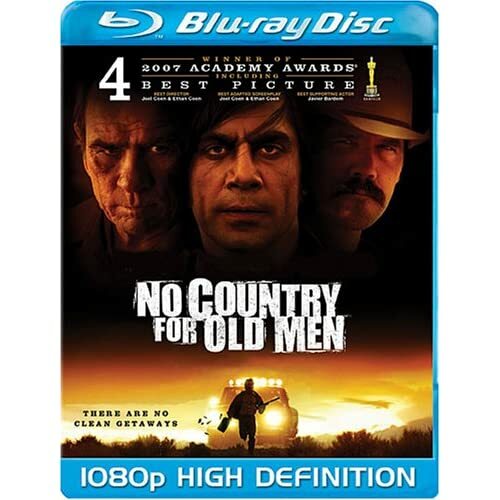 On Blu-Ray disc, No Country for Old Men demonstrates how far home video has come in replicating the clarity and immersion of theatrical sight and sound. In some ways, the home-video student has exceeded the movie-theatre master. At home, you'll never be subject to a reel going out of focus, the picture flaming out as a print catches and burns, or scratchy or improperly built prints. Anyway, Buena Vista delivers a lovely transfer that delivers the Coen Brothers' sight and sound vision with a heartening depth of detail (the only thing Blu-Ray hasn't quite perfected is scenes that take place in shadow, which tend to get a bit grey or noisy). An updated 2-Disc Collector's Edition Blu-ray includes a host of additional bonus features, including a Digital Copy on a second disc. "Josh Brolin's Unauthorized Behind-the-Scenes" (9:19, SD) is a mockumentary making-of produced and directed by Brolin, including interviews with Jones, the Coens, Bardem, production supervisor Karen Getchell and executive producer Robert Graf, Woody Harrelson, Brolin, Kelly MacDonald, and associate producer Dave Diliberto. The chronological Press Timeline provides access to "Lunch with David Poland" (26:30, SD), an interview with Brolin and Bardem; "L.A. WGAW Q&A Panel" (24:13, SD) with the Coens, MacDonald, Brolin, Bardem and Jones interviewed by Alexander Payne; "Variety Q&A" (3:08, SD) with Brian Lowry of Variety chatting up Brolin, MacDonald and Bardem; "EW.com Just a Minute" (12:55, SD) with Dave Karger of Entertainment Weekly interviewing Bardem; the audio-only "Creative Screenwriting Magazine Podcast" (21:25, HD) with Jeff Goldsmith interviewing the Coens; "NPR's All Things Considered" (4:44, HD) with Michele Norris interviewing Brolin; "ABC Popcorn with Peter Travers" (14:51, SD) includes an interview with Bardem, Brolin and MacDonald; "In-Store Appearance" (40:31, SD) with Brolin and Bardem; "Charlie Rose" (22:33, SD) with the Coens, Brolin and Bardem; "WNBC Reel Talk with Lyons & Bailes" (10:02, SD) finds Jeffrey Lyons interviewing Brolin; "Channel 4 News" (3:45, SD) is a British interview with the Coens; "KCRW The Treatment" (28:30, HD) is a radio interview of the Coens by Elvis Mitchell; "NPR's Day to Day" (6:37, HD) is a radio interview with Bardem; "Spike Jonze Q&A" (1:00:47, SD) is a post-screening chat with the Coens, cinematographer Roger Deakins, sound re-recording mixer Greg Orloff, and production designer Jess Gonchor; "NPR's All Things Considered" (7:49, HD) is a radio piece with Robert Siegel interviewing producer Scott Rudin; and "NPR's Weekend Edition" (5:32, HD) is a radio interview Scott Simon conducts with the Coens. Retained from the earier Blu-ray are a few more features. "The Making of No Country for Old Men" (24:29, SD) includes comments by the Coens as well as their cast about the origin of the film, casting and character, location, recreating the period through design, and the secrets of the practical special effects, illustrated with B-roll footage taken on location. The viewer is left to sort out the deeper meanings of the film, but this featurette gives a good behind-the-scenes overview, featuring talking-head interview clips of the writer-directors, Javier Bardem, Tommy Lee Jones, Josh Brolin, Kelly MacDonald, producer Robert Graf, costume designer Mary Zophres, makeup artist Christien Tinsley, stunt coordinator Jery Hewitt, and special effects coordinator Peter Chesney. "Working with the Coens" (8:07, SD) gives a hit-and-run look at the Coens' approach and style, as perceived by themselves and their actors (additional particpants include Tess Harper, production designer Jess Gonchor, and property master Keith Walters). The likewise concise "Diary of a Country Sheriff" (6:44, SD) allows Bardem and Jones to describe their takes on their characters and their methodology in approaching the roles; the landscape as character is also discussed. Especially given that the Coens and Bardem all won Oscars for their work, it's a shame these features aren't more in-depth (and hey, other than standing around in the B-roll footage, where's Roger Deakins? ), but they're certainly welcome and pack in a surprising amount of insight into their short run times. If you put any stock in the Oscars (or my opinion), No Country for Old Men deserves a place of honor on your video shelves. All site content © 2000-2019 Peter Canavese. Page generated at 04/19/2019 08:10:27AM.